If you think your finances are under control because you’re keeping up with minimum monthly payments on credit card debt, think again. To become debt free, you need to pay down more of your balances. How do minimum payments work and why do they keep you in debt? And what do you do if all you can afford are the minimum payments or less? We discuss that on today’s podcast. My average client doesn’t just have one credit card; they owe money on more than three of them when they file for debt relief. 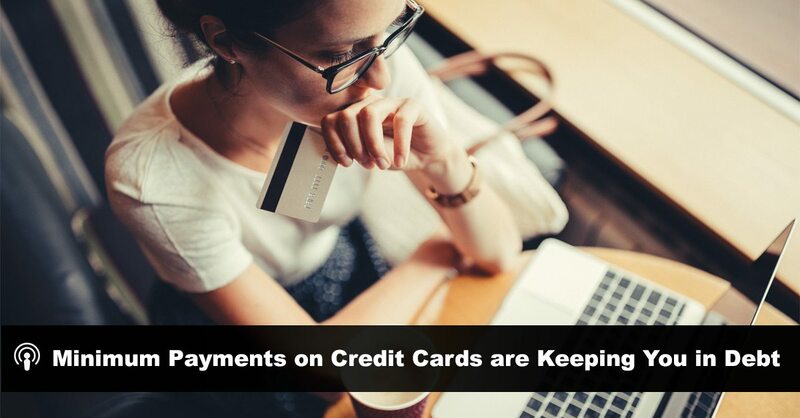 Every credit card is different, but a minimum payment is typically 3% of the outstanding balance, plus interest payments and fees for that month. While it may be tempting to just make the minimum payments on your credit card debt, it’s actually much more harmful in the long-run because only part of the payment you make goes towards the actual principal. The rest goes to interest, so it takes a very long time to pay off your balance in full. Say you owe $3000 in credit card debt at 20% interest. A 3% minimum payment of the balance would be $90. Your interest rate charge will cost you an additional $50 a month ($3000 x 20% / 12 months). So, you would pay a total of $140 in the first month towards your debt – part of it to the principal, part of it to interest. This would be re-calculated every month until you’re debt free. The result? It would take you over 17 years to be debt free and you will have paid over $3000 in interest alone. So, you can see why only making minimum payments hurts your finances. If you want to eliminate credit card debt you must pay significantly more than the minimum balance each month. Carrying a balance also impacts your credit utilization, which impacts your credit score, which may make it more difficult to borrow for something like a mortgage or a car loan. While it would be ideal to pay more than the minimum, or better yet, not have a balance at all, I understand that for some people, that can’t be the case. So, what’s a typical solution if you’re feeling overwhelmed by credit card debt? For the majority of my clients, it’s a consumer proposal. It’s a more affordable monthly repayment plan and lasts up to five years maximum, regardless of the amount you owe. To learn more about paying down your credit card debt and how a consumer proposal can help you become debt free, listen to our podcast. Originally aired January 20th, 2018; Rebroadcast as part of Best Of Show August 4, 2018. Doug Hoyes: Today I’ve got a short “technical tidbits” edition of Debt Free in 30 for you. I want to talk about the most common form of debt in Canada, and that’s credit cards, and I want to explain why only making your minimum payments is keeping you in debt. About 90% of people who file a bankruptcy or a consumer proposal in Canada have a credit card, and my average client doesn’t just have one credit card; they owe money on more than three of them when they file for debt relief with my firm, Hoyes Michalos. Credit cards are about a third of their total debt, and my typical client owes over $16,000 in credit card debt. That may not sound like much, and that’s down from over $20,000 a few years ago, but that’s because we now owe more on personal loans and other forms of debt like mortgages and car loans. So what’s the problem with credit cards? If you pay your credit card balances in full each month, there’s no problem. They’re great. You don’t have to carry cash, you can earn points, and at the end of the month you’ve got a complete list of all of your spending, that you can download to a spreadsheet, or a budget, or an app. It’s wonderful. The problem, of course, is if you don’t pay your balance in full every month. And if you only pay what the credit card tells you is the required minimum payment, you’ve got a huge problem. You go to the store and make a purchase. By law, you get an interest free grace period of at least 21 days, so if you pay your balance in full by the due date, you pay no interest. That’s pretty cool. You just borrowed money for at least 21 days for free! Now let me stop here and mention that the 21-day interest free grace period only applies to purchases; it does not apply to cash advances, so if you take a cash advance on your credit card you are paying interest immediately; there is no grace period. But what happens if you only make your minimum payment? Not surprisingly, you start paying interest. Keep paying the minimum and you keep paying interest. So what is a minimum payment? How does the credit card company figure out your minimum payment? Each credit card is different, but a typical minimum payment will be 3% of the outstanding balance, plus interest payments and fees for that month. Let’s say you owe $1,000 on your credit card. Let’s assume the interest rate is 20%, just to keep the math easy. That means the interest on $1,000 for a month is $200 divided by 12 months or $16.67 for one month. Your minimum monthly payment could be 3% of the balance, so that’s $30, plus the interest, for a total required payment of $46.67. So you paid your credit card company $47 but your balance only fell by $30. That’s why if you only make your minimum payment, it can easily take a dozen years, or more, to pay off your credit card. Here’s an example: you make a purchase of $10,000, the interest rate is 19.99%, and the minimum payment on your credit card is 3% of the balance plus interest, or a minimum of $10. At that rate it will take you almost 13 years to pay off your credit card, and you will pay almost $5,000 in interest! That means that that those things you bought for $10,000 end up costing you $15,000! That’s another reason why only making the minimum payment on your credit card is deadly. The interest rates and minimum payments on credit cards vary a lot. So how do you know the deal on your own credit card? As of September, 2010, the law says that banks and other federally regulated financial institutions must disclose on your monthly statement your minimum payment, and they must show an estimate on your credit card statement of how long it will take to pay your balance if you only make minimum payments. At least once a month, read your credit card statement in detail. Start by looking at the box that says how long it will take to pay off your balance in full if you only make your minimum payments. That should scare you. Then look at the charges. Obviously every purchase you have made will show up, but you should pay very close attention to the interest charged and the non-interest fees charged. Interest charges are expensive, but the non-interest fees can be a killer. Credit card companies have all sorts of fees they can charge you, and that’s where they make a lot of money. They will charge you a fee if you bounce a payment or have an NSF cheque. That fee can be $50. In my previous example where you had a $1,000 balance and had a monthly payment of $47, it’s a real killer if they also add to that a $50 NSF fee. That one charge could double your monthly payment! They also have fees if you are over your limit. If you have a $1,000 limit, and they charge you interest so now you owe more than $1,000, they could charge you an over limit fee. That could be another $50! You can see how those non-interest fees can add up, so watch them carefully. Once a month you should look at your statement, the actual printed statement. I get my statements electronically, but I can go to my credit card companies’ website and download a pdf copy, and it shows things like how long it will take to pay off my balance in full if I only make my minimum payment, so that’s important. But, I don’t only look at my statement once a month. I go online and review my transactions every few days, at least twice a week. Because credit cards can get hacked, and if someone else is using my credit card, I want to know about it immediately. The last time it happened I looked at my statement and saw that I had taken a taxi ride in Toronto yesterday, except that I was not in Toronto yesterday, and I’ve never paid for a taxi ride with a credit card in my life. So, I immediately called my credit card company, they reversed the fraud charges, cancelled my old card, and sent me a new one. It was an inconvenience, but it would have been far worse if I hadn’t noticed the fraud for a month, by which time they had used up my entire credit limit, which is a problem if I was trying to put gas in my car. My point is: check your statement very frequently. Now you understand why only making your minimum payment is keeping you in debt. You want to pay more than the minimum payment. But what if you can’t. My average client earns less than $2,400 per month. Their unsecured debt, for things like credit cards and bank loans, is around $50,000, so even if their interest rates are only 10%, that’s over $400 in interest alone each month. If you add in a minimum payment of 3% on credit card balances, and paying some of the principal on other loans, it’s easy to see why many of my clients can’t even make their minimum payments. They try for a while. They take a cash advance from one credit card to make their payment on another card, but obviously that just increases their debt each month, and eventually they hit their borrowing limit and can’t do it any more. For the majority of my clients, the solution is a consumer proposal. If you have $50,000 in debt, the minimum payments can easily be $2,000 a month. That’s an impossible payment for many people to make. In a typical consumer proposal for someone with $50,000 in debt, we can often negotiate a payment of $250 or $300 per month. That’s a lot less than $2,000 per month! In a typical case the credit cards and other debts you owe money to will accept a consumer proposal where you pay $300 per month for 5 years, or $18,000 in total. You pay $18,000, and you get rid of $50,000 in debt. And that $18,000 includes everything. That includes our fees to administer the consumer proposal (and our fees are set by the government, so all licensed insolvency trustees get the same fee for the same size proposal), that includes all government fees, HST, everything. That’s why consumer proposals have become so popular. If your choice is between paying $2,000 per month just to cover your monthly payments, or paying $300 per month to eliminate your debt, it’s an easy choice. But wait, what about my credit? If I do a proposal I won’t ever be able to borrow again! No, that’s not true. First, if you can’t make your minimum payments now, your credit is already damaged. If you could go out and borrow $50,000 at a 3% interest rate to pay off your high interest rate credit cards you would have already done it. That’s why you are considering a consumer proposal. Second, once the proposal is finished you have no debt, so it’s relatively easy to rebuild your credit and get back on track. So to summarize: if all you are doing is making your minimum payments, you will be in debt for a very long time. If you owe a lot of credit card debt you need a better solution, which for many people is a consumer proposal.